If you are looking for a new pillow there are many to choose from on the market. It is not easy, however, to choose the one that is best suited to your needs. Factors you may consider are your sleeping position, any neck pain you may have and whether you like to sleep with your head on a soft cloud or something firmer. The Purple Pillow is purple! Let’s get that fact stated immediately. However, apart from its color, it offers many benefits that our review of the purple pillow will explain. Manufactured by the Purple Mattress company that we have reviewed recently, this pillow has a unique construction. Like the mattress, all the Purple Pillow reviews you will read will be sure to comment on its unique construction. Who Would Like the Purple Pillow? Who May Not Like the Purple Pillow? The foam used is 2% polyester and 98% Hyper-Elastic Polymer™ formed into a grid structure. When you lie on the pillow, it sinks to accommodate the pressure applied to it. This means that the Purple Pillow is good for all sleeping positions: Side, back and front. When you remove the pressure, either by turning or moving your position on it, the pillow rapidly recovers to its original shape. Somewhat like memory foam, but perhaps with a faster response. The foam itself is not cooling, but when molded into a grid structure, as this is, then there is plenty of air in the body of the pillow to keep it cool. Added to that, the breathable pockets of air in the structure promote a flow of air from the bottom to the top of the pillow. This prevents the accumulation of pockets of heat and keeps you cool throughout the night. The Purple Pillow as delivered is fairly thin: its dimensions are 24” x 16” x 3”. However, it incorporates an Air Boost system that you can use to inflate your pillow to your desired height or thickness. This lies at the bottom of the pillow below the purple foam grid. It is recommended that you start with no inflation, and then add air slowly until you reach your optimum comfort level. Fundamentally, this means that the Purple Pillow provides fully adjustable loft, so you can adjust its thickness to meet your own personal needs. Without this feature, the pillow would be only around 3 inches thick. If you fill the Air Boost layer to 75%, then you will have a pillow that is 7.5 inches thick. You can have anything in between, or take it beyond the 75% air fill (not recommended by the company but you can do it). This feature is of benefit to all types of a sleeper. Side sleepers can adjust the loft to provide support for their head and shoulders – if you have particularly wide shoulders you need a higher pillow in order to keep your head and neck Cervical vertebrae) level with the rest of your spine. Back and stomach sleepers are best with a lower pillow, although some back sleepers may prefer a slightly higher pillow with more loft that front sleeper. The cover is in white with a purple zipper to enable you to remove the interior part of the pillow. It is made from a blend of 92% polyester/bamboo fiber and 8% spandex. The cover can be machine washed on a cold setting and tumble dried. This is an important feature of any pillow. Since few allow machine washing of the entire pillow, the ability to machine wash the cover is extremely useful from a hygiene aspect. Conforms to your pressure points to prevent neck and back pain while sleeping. Loft/thickness is adjustable from 3” to over 7.5”. Can be hand-washed in warm water with dishwashing liquid and air dried. 10 year warranty against manufacturing or material defects. 100 day sleep trial: if you decide it’s not for you within 100 days, return it for a no-quibble full refund. They pay the return shipping cost. Some may find it heavy at 10 lb. A bit small at 24” x 16” – but large enough for most adults. There are no other significant aspects of the Purple Pillow. It feels good to lie your head on, and the Air Boost facility enables you to expand the height of the pillow to suit your personal preference. Although you may feel a small degree of cradling when you lie on it, it is not much and you soon get not to notice it. The edges of the Purple Pillow are quite firm, but not uncomfortable. Those who prefer a pillow with good support and is not too soft. 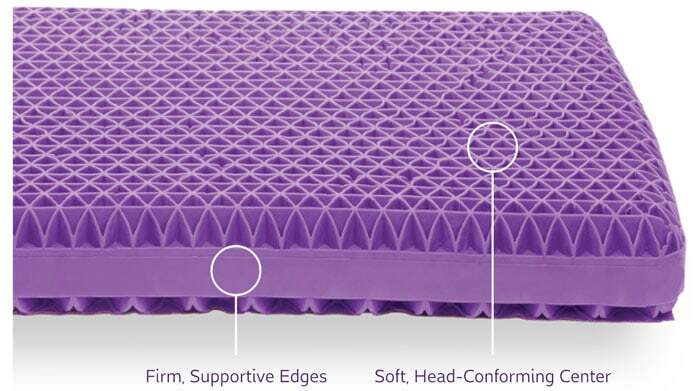 The foam grid that Purple use makes sure that your head and neck are well supported. Those who want to sleep cool without their head or neck heating up during the night. The pillow is designed to allow a free flow of air through it and it effectively keeps you cool. Those who like a pillow that can be made harder or softer when in use. Those who prefer foam to feathers. This pillow contains no feathers and no down. This review of the Purple Pillow has explained the construction of the pillow, and how it can be adapted to suit any type of sleepers. However, not everybody will like it, largely due to its dimensions. 24 inches x 16 inches is not large considering most pillows are larger than this all round. Those who like a large pillow may find this too small for them. However, it is large enough for one person and its adaptability to all three common sleeping positions is enough to overcome this perceived issue. Its primary benefit is its Air Boost feature that allows you to change its thickness, and its cooling properties. This is an excellent pillow if you want a pillow to provide good neck support and help reduce or prevent neck pain. It offers an excellent night of sleep and also more than adequate support for your neck. 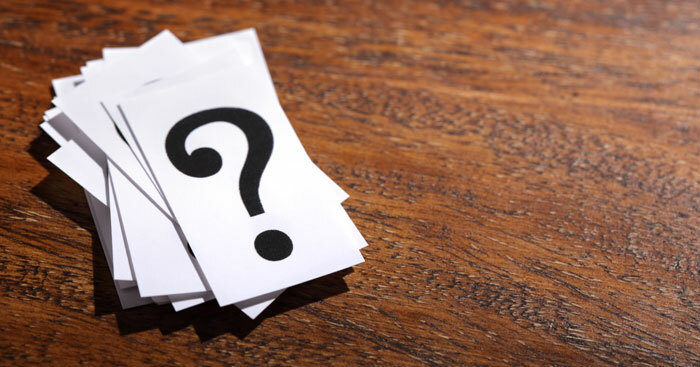 Here are some of the frequently asked questions that our readers ask regarding the Purple Pillow. 1. Is the Purple Pillow toxic? I have read a lot about the toxicity of foams used in mattresses and pillows. No, the Purple Pillow is not toxic. All the foams used are CertiPUR-US certified to be free from toxic heavy metals, phthalates, toxic fire retardants, ozone depleters, and any other toxic material. The Purple Pillow and mattresses have no off-gassing and the Hyper-Elastic Polymer™ used is made using food-contact grade materials. 2. How can you claim that this pillow is suitable for all sleeping positions? Easily! The middle of the pillow is soft and great for back sleepers that need support for their head but not too much support. Side sleepers think they can sleep on just about any pillow, but the Purple Pillow offers adjustable loft through its Air Boost feature. This is ideal for side sleepers who would benefit from a thicker/higher pillow. Stomach sleepers can also adjust the loft to suit their particular preferences. So yeas, the Purple Pillow is suitable for all sleeping positions. 3. Can the Purple Pillow be Washed? This question has already been answered in our review above. The cover can be machine washed, preferably in a cold setting, and it can also be tumble dried. You can wash the Purple foam grid by hand and air dry it before putting the cover on it. This helps to reduce contamination by common allergens. 4. Is the Purple Pillow really colored purple, and if so, why? Yes, it is, just as the Purple Mattress is colored purple. The reason for is this is not aesthetic or because the company likes the color purple! It is because the gel-like substance used to manufacture the Hyper-Elastic Polymer is itself colored purple. Purple does not use normal memory foam, latex or poly foam for its Purple Pillow, but this purple Hyper-Elastic Polymer. The name Purple seemed a logical business name to use. 5. Is the Purple Pillow hypoallergenic? Yes, it is. The Purple Pillow is made using Purple’s Hyper-Elastic Polymer TM which deters dust mites and is hypoallergenic. The cover and entire pillow are hypoallergenic and deter dust mites (a common allergen). This Purple Pillow review has explained the reason for the name and identified the pros and cons of this popular pillow. If you have a need for a pillow suitable for the three sleeping positions, namely side, back, and stomach, then this pillow is suitable for all three. The reason for that is the unique Air Boost feature that can adjust the loft of the pillow to make it suitable for all three types of a sleeper. Yes, it is possible to adjust the loft of other types of pillow. The most common are shredded memory foam pillows where the amount of foam can be reduced or increased via a zippered cover. Rather than take this approach, Purple has decided to use an inflatable vinyl layer at the bottom of the pillow. Air can be pumped into this to increase the thickness or loft of the Purple Pillow.